Hi Guys! I hope you are doing good..
Facial Mists are one of the best ways to keep your skin happy, healthy, rejuvenated and refreshed. Honestly speaking, I never gave a facial mist or toner much importance but as time passed by, I understood the importance of facial toning and hydrating. These two things are extremely necessary to maintain a radiant and happy skin but I always considered them optional steps until I came to know what difference they make in improving your skin texture and overall look. 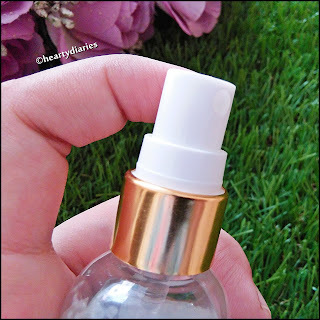 Well, ever since I came know how good facial mists and toners are for the skin, I had been wanting to buy a really nice one and talked about them in my Beauty Wishlist as well.. My inner wish was granted when I received one such mist in my August 2017 My Envy Box by the brand Seer Secrets. The product claims looked highly alluring and this mist is meant to balance, treat and tone the skin. With thousands of mists and toners available in the market, it is a difficult choice to make out which one is worth buying. Although what works for me may not work for you and vice versa, I hope my review helps you to decide if you want to invest your precious money in this product or not, in case we share same skin types.. By the way, you should always read atleast three reviews before buying a product so that you are sure of your decision. Anyways, without blabbering more, I shall quickly get started and let you guys know whether I have found a good facial mist or not.. 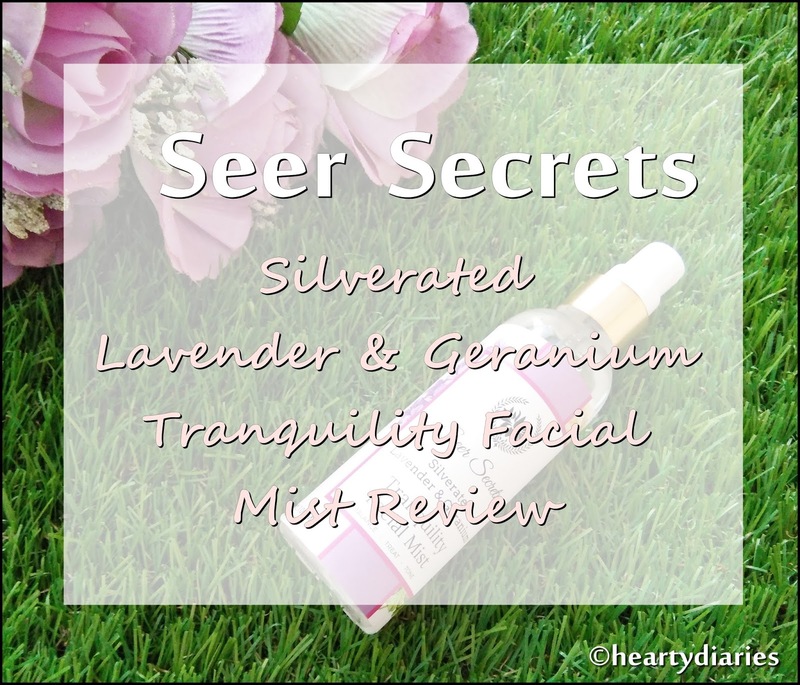 Product Description: Seer Secret’s Silverated Lavender and Geranium Tranquility Facial Mist is a perfect step to add into your daily skin care regimen. This refreshing facial mist can also be used multiple times per day as a gentle skin refresher. It is made with 100% natural ingredients to give you the ultimate skin refreshing treatment. Embrace the best nourishing routine for natural beauty. Daily application will ensure exceptional results. A simple spray or two of the facial essence ensures that you provide your skin with the nutrients it needs. How to Use: Mist evenly over face to give your skin hydration and suppleness. Use as and when required. Place in the fridge for a cooler feeling mist. Can also be misted over make-up during the day. 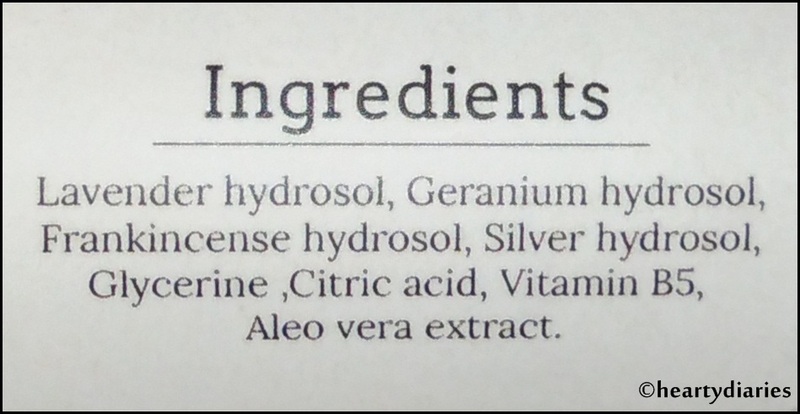 Packaging: This facial mist comes in a transparent, plastic bottle and has ingredients list along with some other details mentioned.. The spritz pump is white in color, has a golden rim and a transparent, plastic cap which locks perfectly. One or two spritz are enough to mist an ample amount of product evenly on the face. The bottle is light weight, travel friendly and allows to see how much product is left. About the Mist: This is a clear facial mist and looks just like water. It is not at all viscous or heavy and feels really light and soothing on the skin. My Experience: This review is based upon my oily, acne prone and sensitive skin. 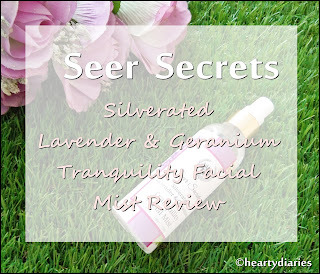 Since this is a Silverated Lavender and Geranium Mist, I was already impressed because Lavender is really beneficial in reducing wrinkles, making skin intact and youthful while Geranium is an amazing ingredient for the skin due to its natural astringent, anti-inflammatory properties..
Every day after cleansing my face in the morning and before going to bed, I use this mist on my face. The pump has a really good quality and just two-three spritz are enough which saves a lot of product. I have already finished 1/4th product in around 25 days and hope it lasts me for at least 3.5-4 months. It feels quite refreshing and is a gentle skin refresher. It doesn’t irritate my sensitive skin at all and soothes it instead. It makes the skin hydrated, nourished, even toned, soothed and radiant. I have really found great results after using it on a daily basis. The inner glow it has given me is simply exceptional and so impressive. It is very gentle on the skin, the beautiful fragrance is not at all over powering and fades away in around 10 minutes without making my skin dry at all. 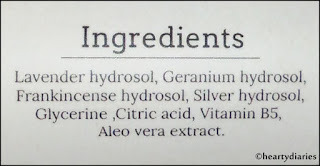 It makes me feel really really refreshed and the smell of Geranium is really beneficial in helping with anxiety as well..
Now coming to the claims and product performance in those terms, this product works well and almost just like claimed but after using it daily, I haven’t noticed any effect on my pores. Well, I love spritzing it on my face even when I am not involved in my skincare, especially while working and on hot and humid days.. This product has become an important part of my daily skin care regimen. I love the fact that it is made up of 100% natural ingredients and is cruelty free due to which I use it multiple times a day as well without any worries. This product travels with me everywhere and I am literally addicted to how supple and plump it makes my skin look. Yes. This product works as claimed and I am highly impressed by it. I will definitely repurchase it once I finish it. Yes. I have found this product to be really effective and beneficial for my skin, so I will highly recommend it to all those people who share same skin type as me. I think it would suit every skin type because it is very mild, soothing and hydrating.. Completely.. This is one of those products which claim less and does more. I find it highly worth the price point. Final Verdict: Despite not closing my facial pores as claimed, I love this product to the moon and back. I actually cannot ask for more from this product and will look out for any other product for closing facial pores. This one is just an amazing friend which I cannot live without. It sits so nicely on my skin and does a lot of jobs for me that I am blown away. I just wish I could find it anywhere in local market as well, so that I can go and grab it as soon as I finish it.. This seems to be my new best friend..